With an electric mixer and bowl, whisk the flours, xanthan gum, and salt. In a small saucepan, stir the milk with 1/4 cup water over medium heat until just warm, about 1 minute. Stir in the yeast and the sugar. To the dry ingredients, add the milk mixture, egg whites, and 2 tablespoons of the oil and beat with a paddle attachment on medium speed, scraping down the sides occasionally, until you have very smooth and thick batter like dough. Remove the racks from the oven set a pizza stone or heavy upturned baking sheet on the lowest rack possible, and preheat for 45 minutes at 400 degrees. Cut two 12 inch squares of parchment paper. Scrape half the dough into the center of each square and coat each dough with 2 teaspoons oil. Oil fingertips and use them to pat and spread each piece into about a 9″ round, about 1/4″ thick, leaving a 1/2″ border at the same time.. Loosely cover each with plastic wrap and let them rise in a warm place until they reach 10″ diameter. 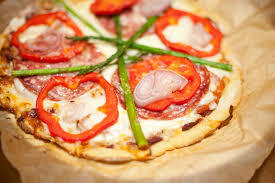 Carefully transfer crust with its parchment to the preheated pizza stone and bake until the top is puffed and firm and the underside is crisp, about 5 to 10 minutes. Carefully remove and transfer to a cooling rack. Repeat for second crust in the same manner. Place an oven rack 4 inches from the broiler. Preheat the broiler. Transfer the baked crusts to 2 baking sheets. Brush 1 teaspoon oil over each crust. Spread with sauce, leaving 1/2″ border, then sprinkle with desired cheese and toppings of your choice. Broil the pizzas, rotating as needed to ensure even browning, or until cheese is bubbly and browned in places and crust is golden. Slice and serve immediately.